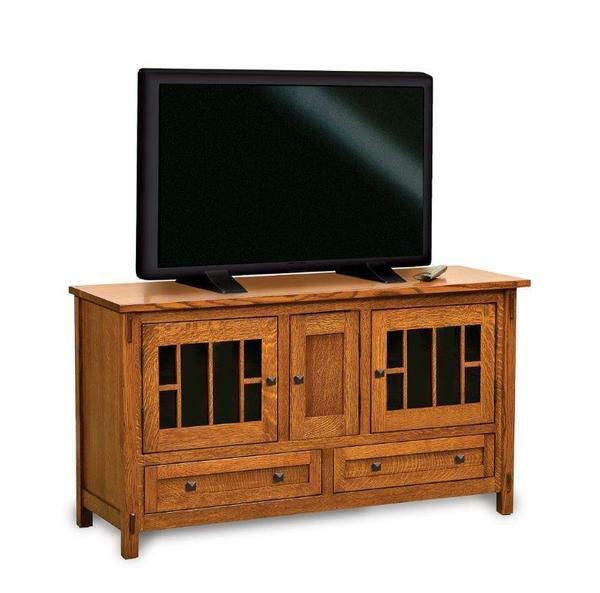 Our Amish Centennial 36" High LCD Stand with Three Doors and Two Doors takes inspiration from arts and crafts style, including details like Mission-style mullions, and exposed tenon joinery. Other standard features are a 1-inch thick solid top, smoked glass, soft close concealed hinges, one adjustable shelf behind the center wood door, two adjustable shelves behind the glass doors, and two drawers. This piece can be made without the exposed tenons and Blum soft-close undermounts can be added to the drawers. Other custom options include your choice of wood type, finish, and hardware.